From my perspective, having grown up in a small midwestern town, teaching now at a small midwestern, Christian liberal arts university, and spending the last eight years reviewing and editing literary submissions for a small, albeit international, Christian literary journal, it still feels like we have a long way to go in breaking American Christianity out of the Manichaeism, Gnosticism, and Docetism that Mark Noll decried back in 1994. While Christian higher education and, to some extent, intellectual print culture has demonstrated an exciting capacity to engage with the life of the mind, the tendencies to set up strong oppositions between Christians and pretty much everything outside a narrow slice of experience labeled "Christian" still persists outside of what we might call "intellectual" Christianity. As James K.A. Smith has been arguing in his Cultural Liturgies books, American intellectual Christianity needs a richer, more biblical anthropology that address not just the life of the mind but the practices that shape our desires and imaginations. As Christians often recognize in their small groups, we need to make the case not just in debates and in print but in the daily rhythms of our lives and in the way we incline toward all experience. It strikes me as too easy to dismiss Smith and others like him by saying he has "some good points" but "goes too far," since this amounts to accepting the status quo, and the status quo is not one in which Christians think imaginatively, much less trust their imaginations in the first place. We could use some folks stretching us, and in particular we need to invite all Christians into the life of the imagination. This is where Dave Harrity's Making Manifest comes in. The book is structured as a four-week, 28-day devotional focused on creative writing and journaling as an invitation to the common believer to live into the full image of God. Harrity opens with Ephesians 2: "For we are God's poemia ('workmanship'), created in Jesus Christ to do good works, which God prepared in advance for us to do." (Harrity explained to me that he toys with the more conventional spelling, poiema, for the sake of the lay reader, certainly a questionable choice that will irk some, but a minor point in context of the book's aims.) For Harrity, imagination, language, and the incarnate Word commune in a dynamic, co-creating relationship: God's poems. Each day's devotion consists of a short reflection followed by a writing prompt designed to help you explore your imagination. Harrity is writing to a broad audience, so he does not attempt to spell out a systematic theology. Rather, each exercise offers a means to explore the uniqueness of your being in the world as a gift that empowers you to carry on the creative work of the gift-giver. For example, week one begins with a poem about the potential of the present moment, then a reflective essay laying out the book's basic logic concerning creativity, and then ends with an exercise that asks "What is it that you want to say to the world? What do you want your voice to be for?" Day two is the first of many to riff on the discipline of stillness or solitude as a way of learning to be present. Throughout, Harrity emphasizes discovering truths about yourself over the beauty of your writing. "It will flesh itself out later," he says. It turns out that it both will and won't flesh out later, and this is probably the main formal complaint one could make. I did not always see how one day's exercise related to the previous, or if something was developing over the course of a week. That said, the exercises did "flesh out" when I put the book aside and turned to my own writing, both poetry and prose. One exercise on describing your first kiss turned into a day-long recovery of an important childhood memory in which I could almost not stop myself from writing. The frequent prompts to go outside and just look led me to some fun poems about flooded fields and bullfrogs. 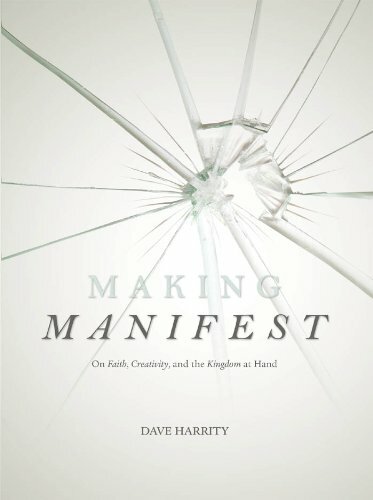 Ultimately, then, Harrity proves trustworthy not primarily through the specific course of the book but through what you discover when you see how much you can accomplish independent of his guidance—and what teacher would mind this? One of Harrity's most helpful insights concerns how we as Christians define perfection. He plays with the metaphor of redemption as "already/not yet." If God is still completing his handiwork, he is in a sense revising his great poem, bringing it by grace from its fallen state into its intended perfection. This perfection is not a Greek harmony of form (too mundane for Harrity). And though it depends on incompleteness, it is not the Romantic notion of completion by the human mind (comically vain for Harrity). Instead, the perfection the Christian knows is a spiritual completeness, a developing relation to our Creator that washes our sins clean without whitewashing the history of sin that reveals the Creator's glory, grace, and love.